Kickers and punters tend to be the forgotten members of a football team. That is, of course, until you need them. Adam Stack Bangin’ it through from 50 yards out! Like when the game is on the line or a season is in the balance. And it’s at that moment that you’re glad you’ve got a good one waiting in the wings to go in and bail out the offense. Or defense as the case may be. Such is the case when the Oregon Ducks football team signed one of the premier punter-placekickers in the country this past recruiting cycle to fulfill this role. Adam Stack from Hononlulu (Kamehameha Schools), Hawaii committed to the University of Oregon in December 2016 and is an early enrollee available for spring practice in April 2017. 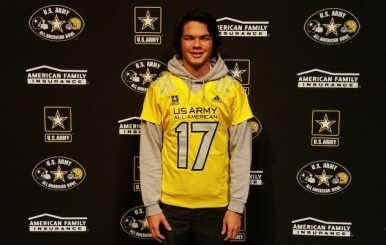 Adam played in the U.S. Army All-American game in January of this year; and is an alumnus of the prestigious Chris Sailer Kicking Academy where he was rated No. 4 in punting, and No. 9 in place-kicking. Stack has been listed at 6’1″ to 6’2″ depending on the source you read in the media. Based on his age I’m guessing he is 98 percent of his eventual height. Adam has been listed at 175 lbs. by ESPN and Recruitingnewsguru.com. With his frame it’s easily conceivable that he is approximately 80 to 85 percent of his eventual playing weight. Projecting ahead Adam Stack will probably be a shade under 6’3″ about 210 lbs. in his final season at Oregon. I did a survey of a little over half of the NFL rosters to get a feel for the heights and weights for punters and kickers. As of right now this projection of Stack would put him in the upper echelon of kickers, and squarely in the middle for punters as it simply relates to size. 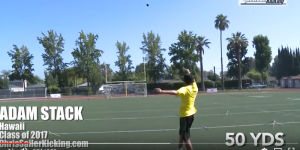 In the video above, Filip Filiopvic of The Kicking Coach describes the proper grip a punter should use set up the ball prior to the kick. Filiopvic punted for five NFL teams over the span of six years. Now watch Adam Stack above demonstrate perfect technique in a controlled environment. Marquette King of the Raiders above demonstrates proper technique in receiving the football, two stride steps and an effortless punt. King is arguably the best punter in the NFL right now. Here is Stack, above, fielding the snap and punting away with two stride steps. Punters target getting the kick away in 1.2 to 1.3 seconds from the snap of the ball. There are three basic parts to place kicking. Lining up correctly, getting the plant foot even with the ball, and hitting the “sweet spot.” We’ll look at some video explaining these techniques and then video of Adam Stack in action. In the video above Ray Guy Award winner Travis Dorsch explains critical steps necessary for a consistent approach to the ball. Former New Orleans Saints Kicker Garrett Hartley demonstrates excellent plant foot placement next to the ball. Former Cincinnati Bengals kicker Travis Dorsch explains above where the primary target or “sweet spot” is on the football that kickers must make contact with to be consistently successful. And here is Adam Stack above demonstrating great technique that Travis Dorsch and Garrett Hartley showed previously. Adam Stack has a big leg. An NFL leg in the punting game. He has the ability to flip the field, to change the complexion of a tight game with one kick. 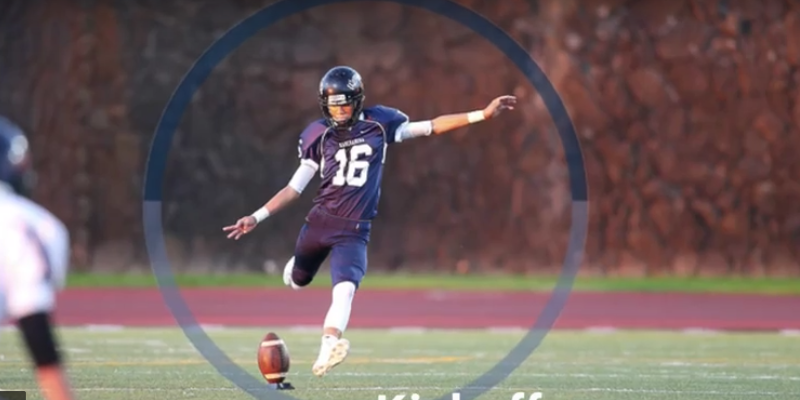 He should establish himself quickly as one of the best punters in the Pac-12. His placekicking is solid and consistent. As he grows into his body, Oregon fans will become accustomed to seeing him routinely hit field goals in the 50-yard range. His NFL prospects are unknown because of the nature of specialists. They tend to be middle to late round picks and quite often free agents. In the last 10 years 41 punters and kickers have been drafted in a pool of a little over 2,500 players. So the odds of making it onto an NFL roster are slim. Having said that, Adam Stack has the size, technique and mental make-up to make that jump from great punter/kicker at Oregon to a career in the NFL.